This isn’t the first time Lena Dunham has released videos defending Planned Parenthood; earlier this year, she made an animated short celebrating 100 years of Planned Parenthood, but completely skated over founder Margaret Sanger’s racist and eugenicist history — and ignored that such racism and ableism still have a place at Planned Parenthood today. She also caused a firestorm of controversy when, during a podcast, she said that she’d never had an abortion, but wished she had. So it’s not altogether surprising as, as avidly pro-abortion as Dunham is, that she would release another video pushing the idea that Planned Parenthood should keep its taxpayer funding. But as before, this video is filled with falsehoods and offensive material. First, it’s worth pointing out — again — that Planned Parenthood is not a health care provider that millions of women utterly rely on. Planned Parenthood, in reality, serves only a small percentage of women when it comes to health care, and performs only a minute number of life-saving screenings. Planned Parenthood performs less than 2 percent of all breast exams, less than 1 percent of all Pap tests, and less than 2 percent of all cancer screenings for women. Prenatal care is so rare that it’s practically non-existent. The truth is, health care at Planned Parenthood has plummeted in recent years, while abortions have increased. Millions of women rely on Planned Parenthood for health care? Hardly. And far from having nowhere else to go, Planned Parenthood is vastly outnumbered by comprehensive health clinics, which provide care for uninsured and low-income Americans — care that Planned Parenthood itself does not often provide. 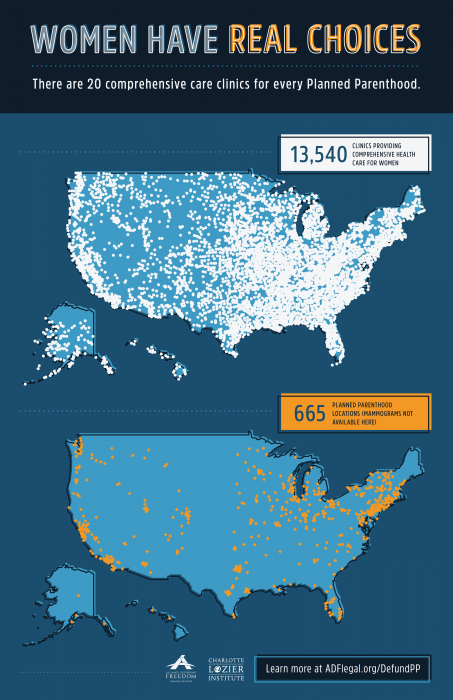 These clinics are also even located in rural areas… Planned Parenthood? Not so much. The most basic of all human rights is simple: life. And abortion takes that right away from innocent preborn children. The humanity of preborn children is indisputable, thanks to advances in our understanding of embryology and fetal development. Preborn babies have their own unique DNA from the moment of conception. It takes just two to three weeks for organs to begin developing; a baby’s heart is beating at 18 days, and is pumping blood at 22 days. At six weeks, the baby has measurable brain waves and can respond to touch. There’s no denying that these are people — actual human beings, who have the right to life just as much as any born person. To not only advocate for these preborn children to be killed, but to do so by calling it “the most basic of all human rights” is a truly sick perversion of the right to life that we all are owed.